With a bendable ruler, you're able to accurately measure the circumference. Wrap the ruler around your bottle. If you're looking for a full-wrap label, add 1/4" to your end measurement. Find the diameter of your bottle. You can do this by measuring the width of the bottle's bottom. Multiply that number by pi (3.14). If you're looking for a full-wrap label, add 1/4" to your end measurement. If you're looking for less than a full-wrap, subtract from your number until you have a length you're happy with. Visit the Shop by Size page on our website or browse through our curated selection of bottle labels. Adjust the slider toward the top to your desired dimensions or enter the exact measurements you need. Once you pick a label, you may want to test it against your bottle. Cut out the dimensions on a piece of standard printer paper and make sure you're happy with the results. Learn more about choosing the perfect bottle label. White Matte – Our weatherproof white matte material has one of the strongest adhesives we offer and is the perfect material for any bottle that may come into contact with ice, water, or moisture. It's tear-resistant and can easily adhere to surfaces such as metal, plastic, and glass. Shop our weatherproof white matte labels for inkjet printers (WJ) or our weatherproof white matte labels for laser printers (LP). White Gloss – The gloss label material will produce photo-quality results, making it the perfect label material for printing pictures or high-resolution images. It's extremely water and tear resistant yet also flexible. Our weatherproof white gloss labels (WI) are available for inkjet printers only. Clear Matte – For an elegant look, our weatherproof clear matte labels are sure to impress. They let your surface color show through while still allowing text or images to be readable. The durable material has a powerful adhesive that works well on a variety of surfaces. Learn more about our weatherproof clear matte material (CX) made only for laser printers. Clear Gloss – Get that "no-label look" with our durable, weatherproof clear gloss label. Its permanent adhesive is extra strong and will stick to most surfaces. Plus, its special top coat won't let ink run, smear, or smudge when submerged in ice or water. Our clear gloss weatherproof material (CL) is available exclusively for laser printers. Metallic Silver – The brushed silver finish on our metallic foil labels is perfect for use in an elegant or decorative setting. The permanent adhesive backing is water-resistant and durable, ready to stand up to a night in the cooler or extreme temperatures. Our weatherproof silver labels (SP) are only compatible with laser printers. View our complete listing of label materials. Launch Maestro Label Designer for an easy design and printing process. Download a blank label template for the label size you've selected in your desired format. All of the templates we offer are free and compatible with the specifications of our label products. Browse our pre-designed templates for professionally designed templates you can customize. Check out 7 Design Sites You Might Not Know About. Learn more about the influence color has on our perception with our Color Psychology Infographic. Browse our Customer Ideas section to see what other bottle labelers have dreamt up. Once you've made your bottle material and size selection, designed the label, and hit print, the next big step is to ensure the label is correctly applied to your bottle. The following steps are among the easiest and most recommended ways to apply a label to a bottle. Place the bottle on a surface that won't allow it to roll. We've found that placing it in your lap and using your knees to hold the bottle securely works well. Carefully peel the corner of the label under the seam away from the protective backing. Grasp the label lightly on both ends and align to the label area on the bottle. Press the label onto the bottle at the center and smooth out to one side. Return to the center and repeat for the remaining side. Smooth all the edges down to eliminate any air pockets or creases. We hope this guide was helpful as you set out to create custom bottle labels that are not only appealing, but functional. 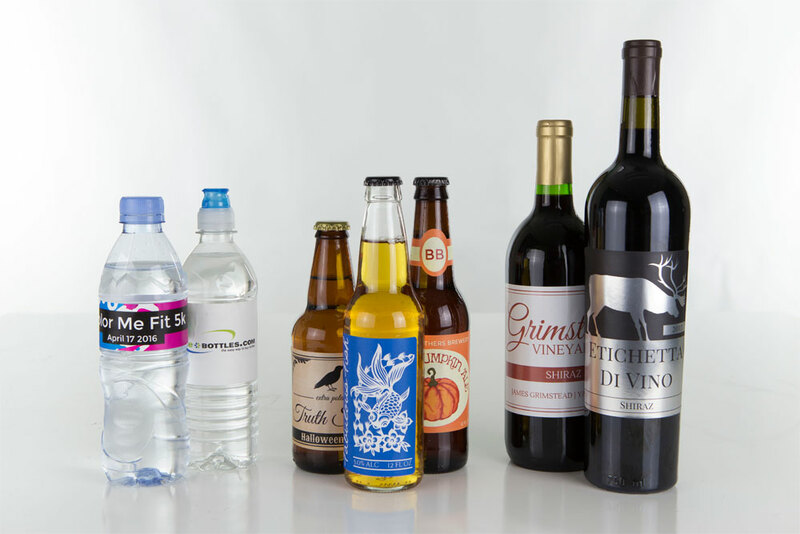 Whether you're creating labels for water, beer, wine, events, parties, or business, our selection of bottle labels will ensure you make the best one possible.